2. Call the Dalai Lama back. 3. Brush teeth more regularly. 4. Figure out if “one carry-on bag” means a carry-on suitcase and like a small satchel or backpack or just the one thing and not both. 5. Drink more yak milk. 6. Don’t wear so much aftershave the girl at the video store makes that weird face. 7. Don’t brag quite so much about never being wrong. 9. Teach others to release the great Zamboni inside them. 10. Like Woody says, “keep the Hope machine running”. 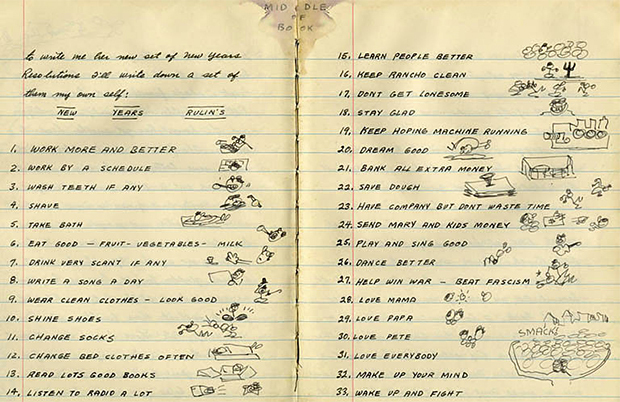 Below are the resolutions of my old friend Woody Guthrie. We traveled the dust bowl together in your great country’s depression and he left this journal with me that has his resolutions. Enjoy and be inspired..
Posted on January 10, 2013 January 10, 2013 by ZambonesmanPosted in knowledge droppings, UncategorizedTagged J. winer, new years resoltions from greaty zamboni and woody guthrie. Next Next post: Zamboni’s reader out-Zamboni’s Zamboni-Nice! Thank you for making time in your busy schedule to remind us to consider our new year resolutions. I know you can’t research all the facts so I will help you with the question of what is a permitted carry on when flying on an airplane. (Other forms of flying are less clear).Two carry on items are allowed: one suit case and one personal item, such as a leather monogramed brief case, water proof diaper bag, grocery bag, large stuffed animal, potted plant, 480z. bag of potato chips (if purchased inside the security gate), animal travel case with dog cat, or turtle, musical instrument that fits in overhead compartment, (however your cello must have her own seat,) manual typewriter (which can be used even during take off and landing), blow up mattress that can be inflated incase you are very sleepy, folded bicycle if it fits under the seat, the AARP application kit that was sent to your inner child. That should about cover it.